The Pandora was a seaworthy 22' sailboat built in England which I purchased new. It looked like a small Contessa 26 on top and a Shark underneath with its fin keel. I added a twin jib setup for running. Two Danforth anchors were mounted on their sides in teak blocks on the outsides of the bow pulpit as it came with one small bow roller. The boat was powered by a Honda 7.5 HP four stroke outboard motor lying in a well in the cockpit. On long passages I would remove it and put it in a cockpit locker. The only navigation gear was a compass and depth sounder. I had no VHF radio (expensive at that time) and I estimated distance by using estimated speed and a watch, something I got remarkable good at - with help from the depth sounder in fog. The boat had a companionway shaped like a Contessa - but with a sliding hatch. It sailed very well with the vane gear - it would sail itself on all points of wind down to about 5 knots of wind speed. I carried a small inflatable dinghy which I just rowed. The water in the Great Lakes is cold and a small cooler sitting on the hull bottom is all I needed for food and drinks as the ice lasted several days. I carried two anchors and 300' of 1/4" chain (I used an all chain rode) and mounting them sideways in teak blocks on the bow pulpit proved very convenient and they never moved in any weather. I sailed the boat very actively, usually going from my base at Pickering to Toronto (22 nm) most weekends taking friends, frequently my favourite, Martina. 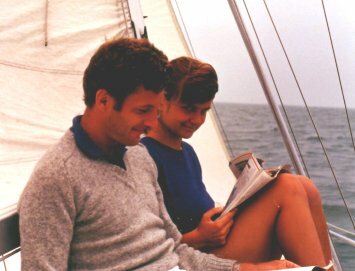 These trips, in all kinds of weather, gave a good base of valuable sailing experience.